Our gelato is made fresh daily using the highest quality ingredients including fresh fruit sourced from local farmers and carefully selected ingriendents. The result = luscious, super creamy gelato that’s full of intense flavor. We are obsessed with good food and experimenting with flavor. Come taste the difference! 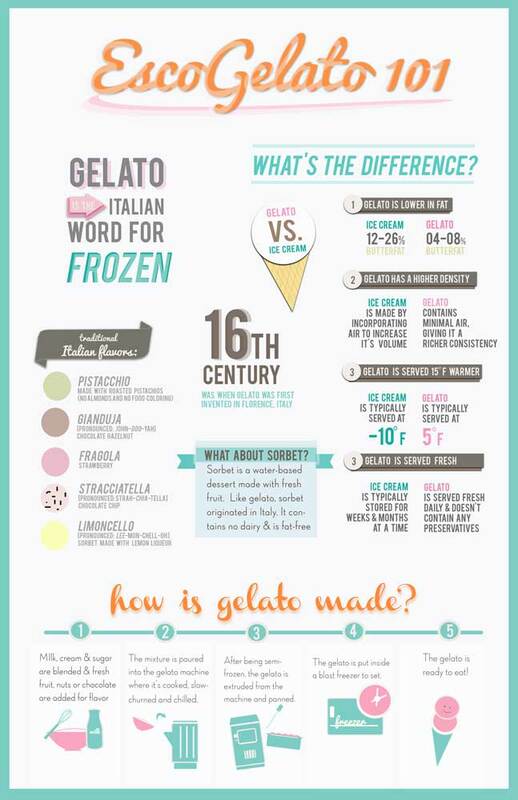 It’s very similar to ice cream, and usually described as “Italian ice cream,” except it’s typically made from some type of milk, rather than cream, and has a substantially lower butterfat content. Now I also happen to love ice cream, and in ice cream, the higher the fat the better, which is what separates the so-called super premium ice creams like Ben & Jerry’s and Haagen Dazs from the regular supermarket brands. But the higher butterfat really lends itself to decadence in the more dessert-like flavors, especially anything chocolate-based, and leaves a fatty finish on the tongue, very indulgent. There is a reason why chocolate peanut butter sells well as an ice cream flavor and watermelon does not. Gelato, on the other hand, is much creamier, in the physical sense, served warmer and thus softer, and you can taste the flavors more at lower temperatures. It’s smoother in texture but actually denser because it has less air incorporated in it, giving it a really thick and unctuous feel without the fat. But the lower butterfat is the most important thing: absent the overpowering fat, the flavors of ingredients really shine through, especially with fruits and nuts. You can still get earth moving chocolate gelato but it is because those who make it tend to use extremely high quality artisanal cocoa, and chocolate gelato inevitably leans towards the bittersweet end of the spectrum.